Today's guest post is from my friend, Vidya Nayak Shenoy. 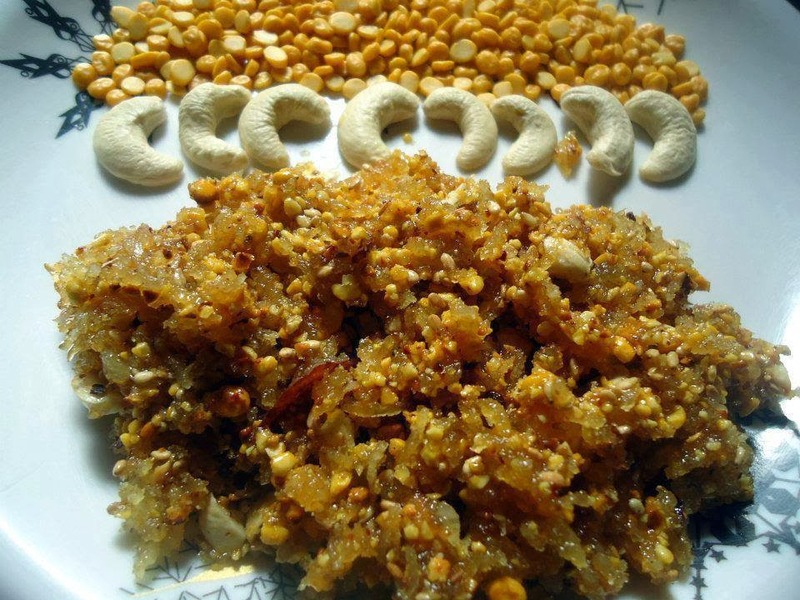 Her dish is a sweet made of Bengal gram and jaggery which we usually make for pujas and festive occasions. I am sure you will love this as much as I did. Dry roast the chana daal on low flame till you get a nice aroma. It should take about 15-20 minutes. Cool it and powder to a rawa consistency in a mixer. Keep aside this coarse powder. Dry roast the cashewnuts and keep aside. In the same kadhai, dry roast the white til and keep aside. Finally, add the roasted cashewnuts and roasted white til and stir well. Thanks, Vidya for your recipe and the lovely picture.